I haven't had much time to blog, given my summer school and private practice commitments. But I have had some great days on the water with old and new clients. About a month ago. Mike Romano from Houston came down and fished with me. He'd never caught a redfish on the fly, and he was able to catch his first four reds with me. We started, as usual, on the sand and found tailing reds spread out in all directions. Mike was able to stalk several there, before finally hooking and landing his first red on a fly. Once the sun rises, the reds leave the sand and head west. After a couple of hours of stalking single snd pairs, we were left with only sheepshead punctuating the glassy surface. So we left and headed to parts unknown until entering a birding venue at midday. It was a long shot that we would find pods working under birds at 1 pm, but I'm never surprised by what the Lower Laguna offers up. Indeed, we found large pods of 30-50 fish feeding vigorously in 12 inches of water. By that time of day, most of the anglers have left the grassy west-side lagoons, so we had it to ourselves. Mike managed to land three more reds before heading in. This past weekend, I had the privilege of guiding an old client, Dr. Dan Casso and three of his friends. Truett Cawlfield worked with me to provide the guiding for the two days. Truett is a gifted angler, and has a great future as a Laguna Madre guide. It was pleasure working with him. It was tough fishing. 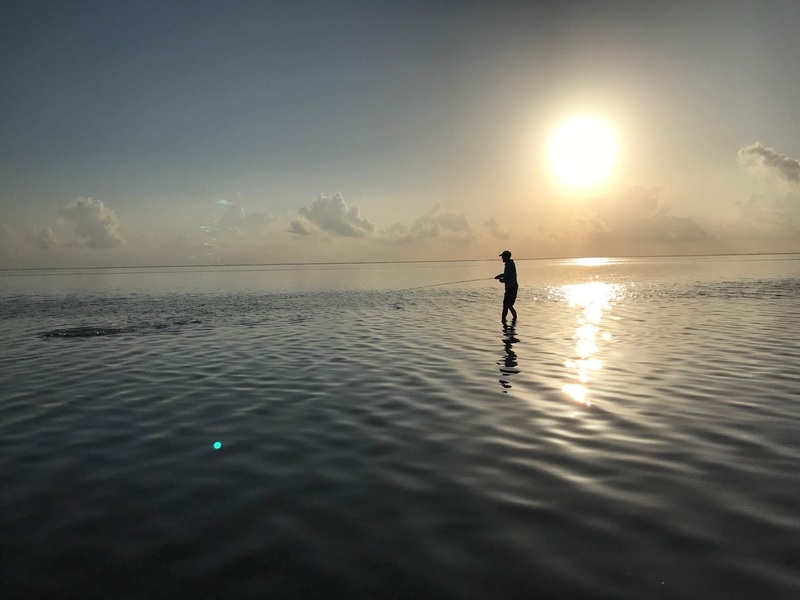 The early action on the sand was remarkable on both weekend days, but after that, it was difficult to find catchable fish. It's been turning off earlier than it used to, so I've taken to encouraging my clients to go in earlier than usual, and then go back out around 6 pm. The four guys opted to do that at the end of the first day. 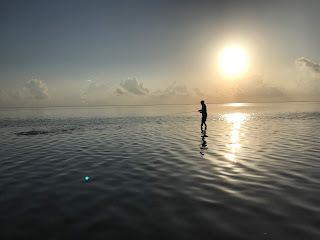 I headed as far east as my Stilt could go without needing to be pushed out into the deeper water. Alas, the redfish action was not "on," so we went to a west-side venue known for its large reds feeding just before sundown. the area, driving bait into the air. Unfortunately, the guys didn't hooks up on one of these oft-oversized reds. Okay, so what the skinny? Fishing early on the sand had been reliably good, but it falls off after a couple of hours. Then the sand is devoid of life, and a guide runs around looking for miracles. There are some fish to be found, such along the Intracoastal spoil banks, but they are few and far between. I have been convinced that that best action is early and just before dark, and have found this assessment to be almost 100% reliable. When I woke up this am, I realized that today was going to be especially challenging, given the wind predictions above 25 mph. We went into water on the east side that was glassy, even in the wind. The guys had shots at tailing pairs of redfish, but were unable to hook up. Then we headed north to the East Cut, and they opted to wade over the oysters on the north side so they could fish largely untouched water. It was eerie at sunrise. Glassy water as far as we could see beyond the place I'd shut down. It was perfect conditions; but unfortunately, the number of redfish showing didn't provide enough targets to make it worth our while. So we headed north and entered the east cut before committing to a wade beyond the oysters on the north side of the cut. The treacherous wade across the oyster barrier was enough to make me worry about my liability; but the guys were able to negotiate the oysters and emerge on the north side where we found some tailing reds. One of my clients caught a red before I headed back to get the boat. Meanwhile, the guys spotted a huge redfish, or so they said, and couldn't get the fish to take their flies. I suggested that it was a black drum, but Mark insisted that it was a red because it had a spot on its tail. The wind turned form windy to fierce about midday, and the flats were devoid of life. Running south from the East Cut after fishing there for a while, I realized that the best opportunities were behind us. So I circled back to the Cut where I suggested we fish the little channels that cut into the flats on the north side of the channel. Choosing one that we hadn't fished yet, I anchored the Stilt and encouraged Tom and Mark to fish the inlets for reds and giant drum. As it turned out, the inlet I'd chosen was full of black drum from 15-45 pounds. After casting a few times, Mark hooked up on the biggest fish he'd ever caught on a fly rod. We figured it was 40 pounds. After a few photos, he released it and we soon headed south again, back to the Arroyo. More and more, I'm offering my clients to split the day into two halves. We come in midday, nap, and then go out in the evening. 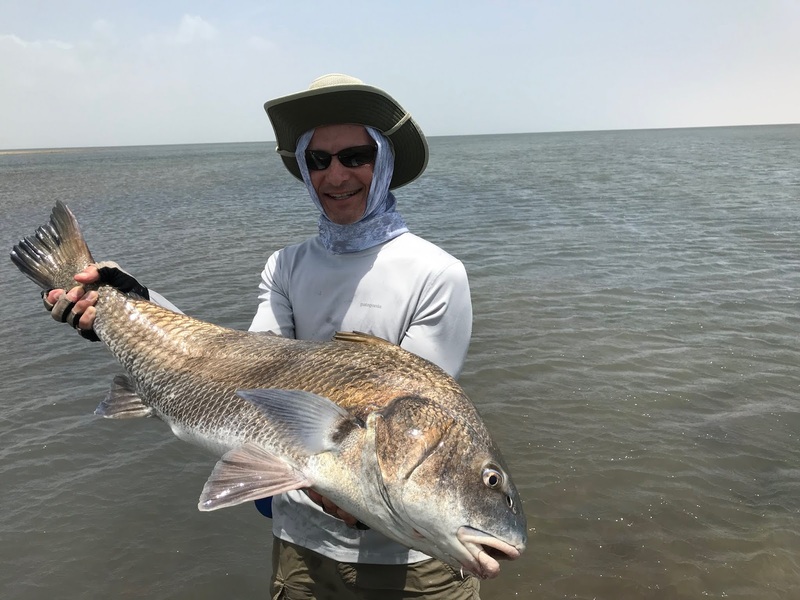 Whether this divided action is due to hotter temperatures or something else, I am convinced that the Lower Laguna Madre is fishing differently than it used to. The summer afternoon action on the sand seems a thing of the past. But the sunset drama is worth the tradeoff.